Tous les arts sont frères, chacun apporte une lumière aux autres | One quality, the finest. 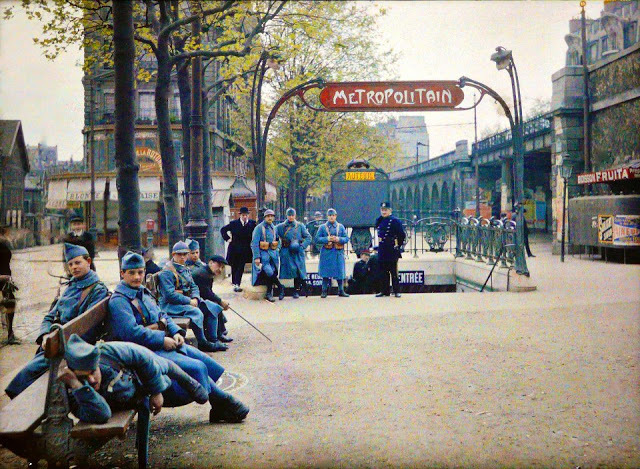 The other day, a colleague made my day when he sent me a link to a site featuring photos taken in Paris in the early 20th century using Autochrome colored film. This film was created by the Lumière brothers, early movie pioneers. The first web site led me to another one with even more astounding photos from 1907 to 1930. The film was created with a black and white emulsion on a plate of glass combined with red, blue, and green-dyed dots of potato starch layered on the other side that acted as filters. The filters made it necessary to use very long exposures and a tripod. The dots create an effect similar to pointillism, so the photos had a dreamy, Impressionistic look even when they were first taken. They were often projected for public display, which means that some of the existing slides are “tanned” by over-exposure to the light source. 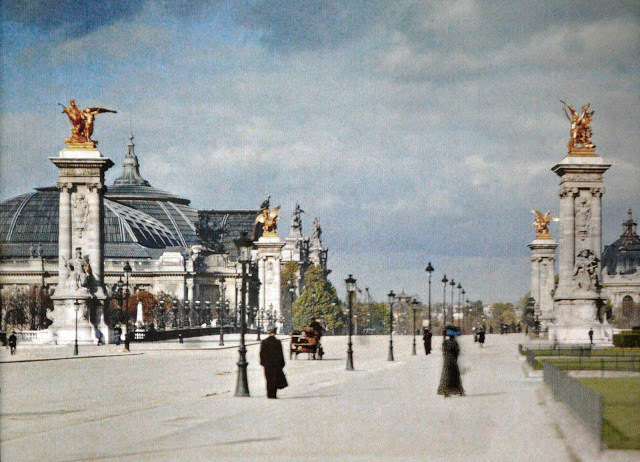 In the heyday of Autochrome, the Lumières produced 6,000 plates of color film a day. The pictures here are part of the collection of Albert Kahn. His collection of 72,000 Autochromes in his museum in Boulogne-Billancourt, near Paris, depict life in 50 countries around the world. Autochromes were phased out in the early 30s. Recently, some photography enthusiasts tried to replicate the process using the old Lumière equipment but without the same success as 100 years ago. 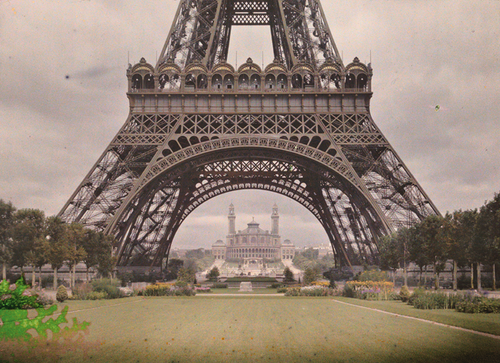 The pictures give an astounding view of Paris from a century ago. While clothing styles and occupations have certainly changed, Paris is virtually untouched in many of the photos. The absence of cars is striking, especially since traffic congestion in Paris is legendary. There is a French proverb that says “Tous les arts sont frères, chacun apporte une lumière aux autres” (too layz ar sohn frair, shakun ahport oon loom-e-air owes owetruh). It means, “All the arts are brothers, each one provides a light to the others.” I thought this was perfect for brothers named “Light” who played critical roles in the development of both the art of filmmaking and the art of photography. 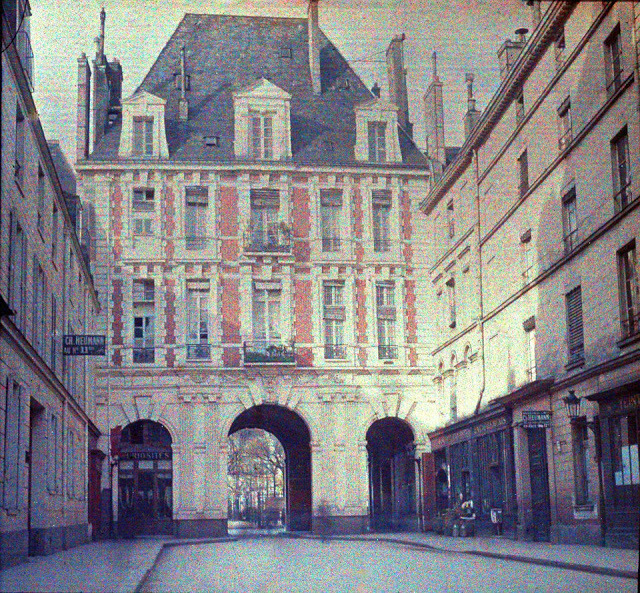 This entry was posted in Photography and tagged Albert Kahn, Auguste and Louis Lumière, Autochrome Lumière, Color photography, Lumière. Bookmark the permalink. Beautiful. These are quite a treat. Thank you for sharing. Thanks for visiting and for taking the time to leave a kind comment. It’s much appreciated! Great post. I hadn’t heard of this type of print before and another museum to put on my list to visit. The avenue looks much wider without the cars. Love your phonetic French. Thanks for the visit, your kind comments, and the re-blog. 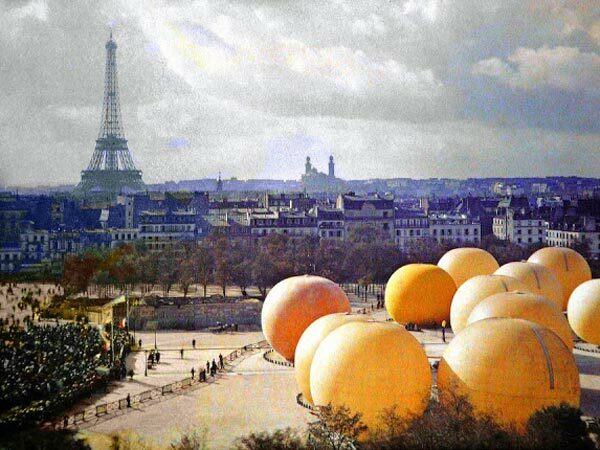 Autochrome colored film in Paris, another interesting post from Patricia Glibert…. Having recently seen the Atget exhibition in Sydney I was delighted these photos of Paris from early 20th century. So, another museum to visit on my next trip to Paris. Thanks for visiting and for taking the time to leave a comment. Atget’s wonderfrul, too, isn’t he? I love these photos. They capture a world that would otherwise be lost to us. The Library of Congress also describes how the photos were taken. They appear to have used a slightly different method than the Lumiere brothers (no dots). Pingback: Le cinéma est une invention sans avenir | One quality, the finest.